Ubar Grotto is proud to have a distinct and unique fez among the other Grottoes of the Enchanted Realm. Many have asked just where our fez comes from, who was responsible for that unique piece of haberdashery, and how they can get one. Let’s tackle each question one at a time; the Ubar fez was created by Jason Rodgers, owner of Fez-o-rama, a business devoted to creating spectacular and unique fezzes. 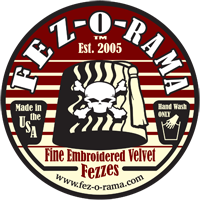 Seth Anthony, the chairman of the organizing committee and Charter Monarch, had purchased fezzes from Fez-o-rama before. He had even commissioned limited edition fezzes for Pennsylvania DeMolay. As the new Grotto was being formed it was only natural that he would go to Jason and ask for his assistance in creating a unique piece for Ubar. Seth supplied Jason with the Supreme Council code pertaining to fezzes and told Jason that he had to work within those guidelines. Jason worked his magic and several months later the Ubar fez was created! The design is created with embroidery and appliqué and each piece is hand made. The fezzes are naturally rigid and require no inserts to keep their shape. 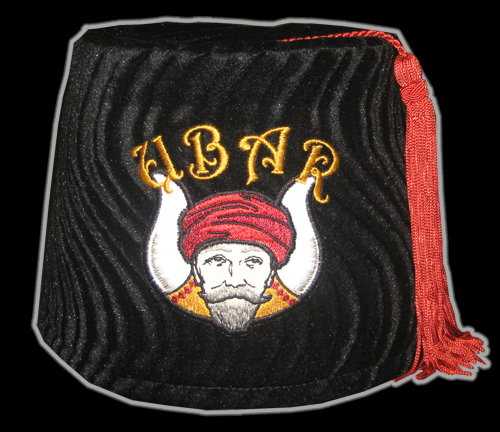 If you’re really desperate for an Ubar fez, you are always welcome to become a member and join our motley crew! Just head on over to the I want to Join! page and sign up!